Shell M Racing (Castor Synthetic) - A high performance castor/synthetic, SAE30 oil for 2-stroke and 4-stroke racing motorcycle engines. 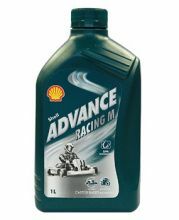 Shell Advance Racing M is specifically formulated for highly stress conditions experienced in speedway motorcycles and go-karts burning alcohol/methanol fuel mixtures. The castor/synthetic blend ensures longer life than a straight castor oil. It can also be used in separate 2-stroke and 4-stroke race gearboxes.